Manchester United fans will be encouraged with the latest noises coming out of the England camp. On Tuesday night, it was reported that Marcus Rashford will likely miss Friday night’s Euro 2020 qualifier against Czech Republic due to a niggling ankle injury. England boss Gareth Southgate is considering calling up Borussia Dortmund starlet Jadon Sancho as the Manchester United striker’s replacement. While United supporters may understandably panic at the words ‘Rashford’ and ‘injury’ in such close proximity, there has been no suggestion that it is a serious problem, enough to plunge into doubt his involvement in the remainder of the club’s campaign. No, it is more likely that this is precautionary, a chance for Rashford to get a much-needed breather and perhaps have him fresh for England’s second qualifier, away to Montenegro on Monday night. But United won’t want Rashford involved at all, for he more than any of his club teammates needs a rest. The 21-year-old has played a lot of football this season. For club and country, he has featured in 3,045 minutes, having also been part of England’s World Cup squad last summer. The last three months have, however, been particularly intense. He has started 15 out of 19 under Ole Gunnar Solskjaer, with the 3-0 win away to Fulham the only game in which he has been given a full rest. In the 0-0 draw with Liverpool at Old Trafford in February, the forward injured his ankle, but due to United already having lost Ander Herrera and Juan Mata in the opening 25 minutes, he played on. 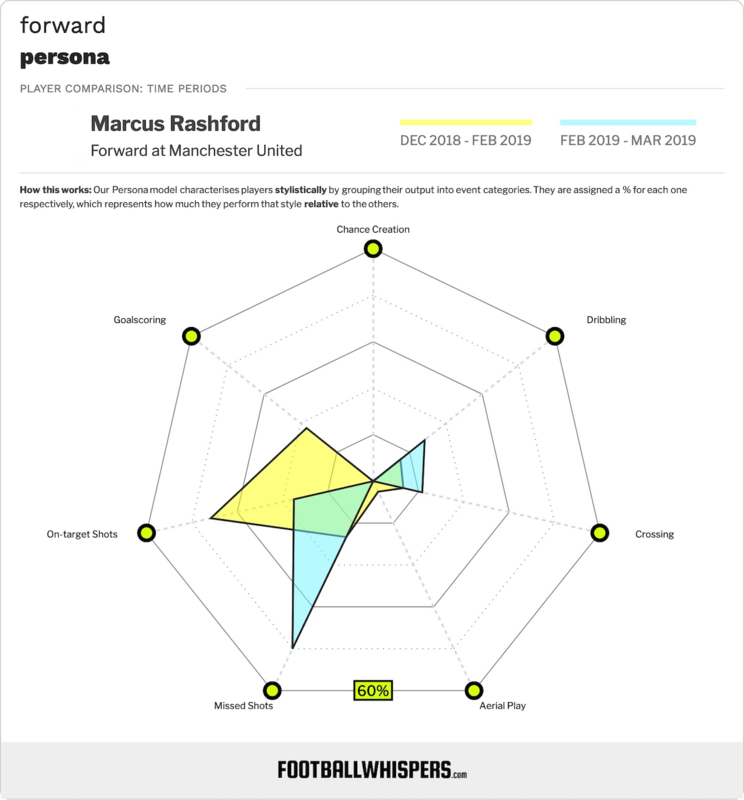 As a result, he looked far from 100% that afternoon and, while Solskjaer decided to restrict him to 13 minutes for the Crystal Palace game three days later, Rashford was straight back into the line-up for the defeat of Southampton. Since then, he has played every minute against Paris Saint-Germain, Arsenal and Wolves. It’s worth remembering, too, that despite some suggestions to the contrary, the forward was used as much as any other outfield player under Jose Mourinho. He made 61 appearances in 2017, more than any other player in Europe. For the 2017/18 season as a whole, he played a total of 2,676 minutes. Under Solskjaer, though, United have upped the intensity in training and during matches. The effort poured into sessions at the club’s Carrington base has been attributed to the recent spate of injuries, with Herrera, Nemanja Matic, Lingard and Alexis Sanchez among those affected. Although last week’s FA Cup exit to Wolves was a blow, United have plenty to fight for during the last two months of the season. They remain in contention for either third or fourth place in the Premier League and can look forward to a Champions League quarter-final meeting with Barcelona, the club’s biggest European game since David Moyes’ men lost to Bayern Munich at the same stage in 2014. And, with Sanchez out and Lingard and Martial not on top form, Solskjaer needs Rashford at 100%. The data certainly suggests that the young Englishman’s performances have dipped since that knock against Liverpool. 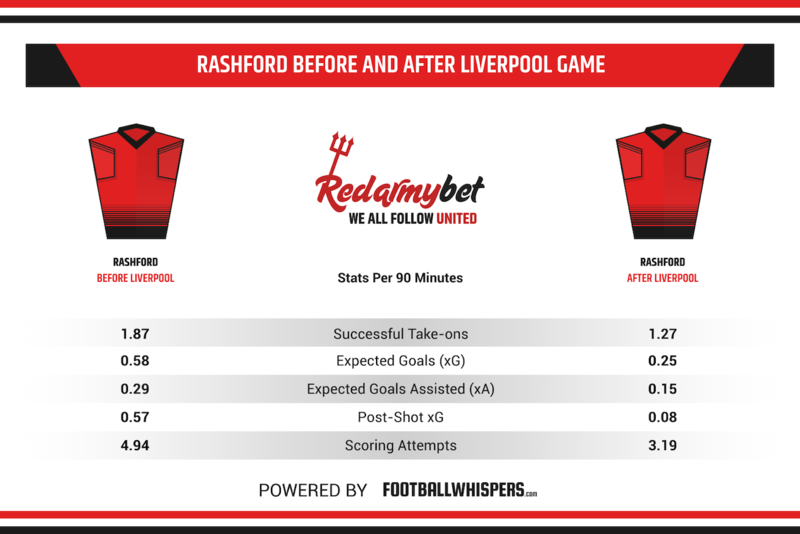 Between the Cardiff game – Solskjaer’s first in charge – and Liverpool, Rashford was managing more total and successful take-ons per 90 minutes (going from 3.61 and 1.87 to 2.87 and 1.27 respectively), an indicator that he has not been able to drive at defenders quite as much due to concerns over his ankle. His passing and shooting accuracy have suffered, too. Before, he was averaging 84.2 per cent and 51 per cent passing and shooting accuracy but they have since dipped to 72 and 20 per cent. He is also attempting fewer forward passes and his long ball accuracy has taken a hit. Most tellingly, however, Rashford’s expected goals statistics have decreased. He has gone from 0.58 xG per 90 to 0.25 and has almost halved his expected goals assisted output, going from 0.29 to 0.15. His post-shot xG per 90 – a metric which measures both the location of a shot as well as which part of the goal it subsequently hits – has gone from 0.57 to 0.08. What this tells us is that United’s No.10 isn’t quite firing on all cylinders, both in terms of sniffing out chances, creating chances for others and making the most of opportunities he does get. There can be no doubting his progression over the last few months. Under Solskjaer, Rashford has looked confident and clinical. Yes, he found the net against PSG and Wolves recently but they do not sufficiently mask the player’s desperate need for a break. In that PSG game, he lost possession more than any other player on the pitch (5) and managed just 47 touches. In the defeat to Arsenal, he had the fewest touches of any outfield player (43) that completed 90 minutes while, against Wolves, he again lost possession more than anyone else and managed even fewer touches with 39. His influence on games have waned but the situation can be salvaged. The best-case scenario for United is Rashford sitting out both of England’s games to give him an extended period of recuperation before the Premier League resumes on March 30. United have at least ten games between then and May 12 and they’re going to need Rashford – a player whose game is built on bursts of speed that can stretch defences – at his best during such a gruelling finale to the campaign.